Truffles are among the world’s preeminent culinary delicacies. Revered for millennia, only their price has kept pace with their fame. Retail prices in the U.S. for Tuber melanosporum, the French black truffle or Perigord truffle, and Tuber magnatum, the Italian white truffle, have reached $1000 and $3000 per pound. Most truffles are harvested in the wild and since the wild supply is diminishing, prices continue to climb. Truffles are a form of mushroom that develops underground in symbiotic association with the roots of trees. The breakthrough that made their cultivation possible was development of technology to inoculate host trees with the fungus under controlled conditions. The use of inoculated trees to cultivate Tuber melanosporum and other truffles has proven successful over the past 20 years in Europe and many farms, including two in the United States are now producing French black truffles in other parts of the world. 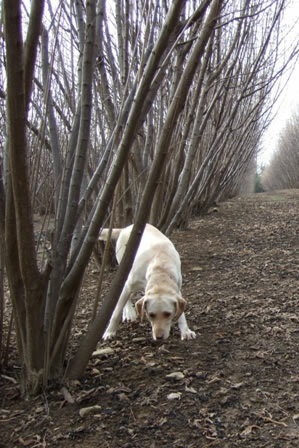 To cultivate truffles, inoculated truffle trees are planted in orchards much like those for fruits and nuts, except that the crop appears below ground and is usually harvested with the help of trained dogs or pigs that can smell the truffles through a layer of earth. Truffles begin to appear several years after the inoculated seedlings are planted and production can continue for decades. The onset and duration of production depends to some extent on the species of host tree. Yields vary dramatically: some farms produce as much as 150 pounds per acre each year while others produce little. Typical yields in Europe range between 25 and 35 pounds per acre each year, but as methods improve many more farms are achieving yields in excess of 100 pounds per acre. New World Truffieres produces truffle tree seedlings (oaks, hazelnuts and other species) inoculated with Tuber melanosporum and other truffle species in North America. These seedlings are checked individually to confirm the presence of the fungus and we provide a quality guarantee that the trees are viable, abundantly colonized by the truffle ectomycorrhizae and completely free of competing truffle species. We are also engaged in an active research program testing new hosts, more truffle species and various cultivation practices for farming truffles in our soils and climates. Please contact us for more information about truffle farming, to purchase inoculated seedlings. We also welcome contact from existing truffle growers around the world.